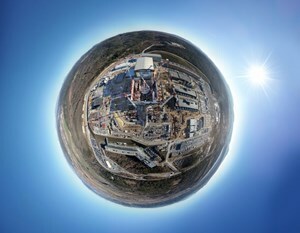 The ITER Project is currently under construction on a 180-hectare site in southern France. Thirty-nine buildings and technical areas will house the ITER Tokamak and its plant systems. The heart of the facility—the Tokamak Building—is a seven-storey structure in reinforced concrete that will sit 13 metres below the platform level and 60 metres above. Pre-assembly of Tokamak components will take place in the adjacent Assembly Hall. Other auxiliary buildings in the vicinity of the Tokamak Building will include cooling towers, electrical installations, a control room, facilities for the management of waste, and the cryogenics plant that will provide liquid helium to cool the ITER magnets. Europe, as part of its commitments to the project, is building nearly all of the platform buildings and site infrastructure. An estimated 2,000 workers will participate in the construction of the ITER scientific facility. Over the next years each building, as it becomes ready for occupation, will be handed over to the ITER Organization for the start of assembly works. The successful integration and assembly of over one million components (ten million parts) built in the ITER Members' factories around the world and delivered to the ITER site constitutes a tremendous logistics and engineering challenge. An assembly workforce of approximately 2,000 people will be needed at the height of assembly activities. In the ITER offices around the world, the exact sequence of assembly events has been carefully orchestrated and coordinated. The first large components began arriving in 2015. In 2019, we are expecting the first 310-tonne toroidal field coil (from Japan) and the first 440-tonne vacuum vessel sector (from Korea). In November 2017, the ITER Project passed the 50 percent milestone of work scope completed to First Plasma. (See related article here.) At the end of 2018, the percent completion figure (to First Plasma) was 60 percent. Take a virtual tour of ITER construction here.